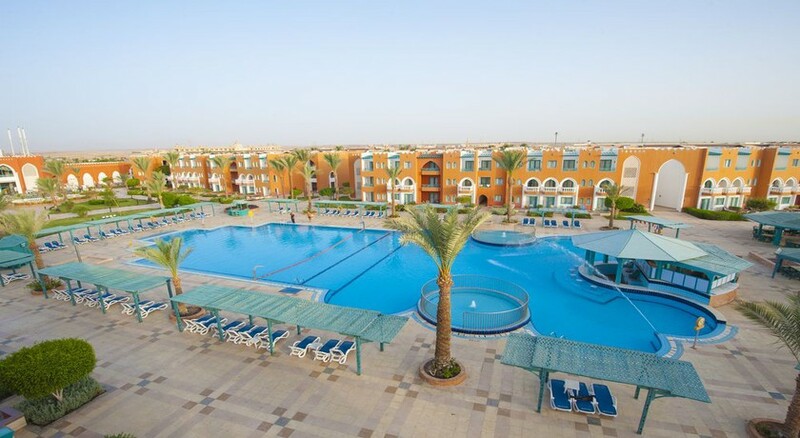 The SUNRISE Select Garden Beach Resort & Spa is an all-inclusive family friendly spa resort located in a quiet private beach on the Red Sea coast in Hurghada. Boasting of a great location in close proximity of a coral reef and nestled amidst spectacular landscaped gardens, this hotel invites guests to enjoy a splash-tastic time with modern comforts and warm Egyptian hospitality, with access to an international diving centre, three swimming pools and a rejuvenating spa and wellness centre. The property is located 100m from a quiet private beach in close proximity of a coral reef on the Red Sea coast in Hurghada. 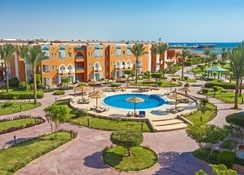 The Sand City Hurghada is just 1.4km, while Senzo Mall stand at 1.6km. The Jungle Aqua Park is 1.6km away. The Distance to nearest airfield, Hurghada International Airport is 14km. The SUNRISE Select Garden Beach Resort features immaculate well-appointed guestrooms in several types such as standard, family, beachfront rooms, mega family rooms and specials needs room. The comfortable guestrooms have private terrace or balcony and come with air conditioning, private bathroom (shower, WC, hairdryer), telephone, TV, heating, mini bar and safety box. Baby cot is available on request. Guests have a choice of seven a la carte restaurants. The Boulevard is a grill, while Mongolian serves delicious cuisine from that region, and there is the Nasaya restaurant and lounge which serves beverages during the day and international dinner at night. There are also two pubs and four bars serving drinks and cocktails including a Pool Bar and a Beach Bar. Kid friendly buffets are available. The hotel has a three swimming pools (one heated), and kids’ pool and terrace besides access to the private beach. There is a fully equipped gym for those who wish to stay active. There is a lovely spa with steam room offering massages and therapies and beauty services are available at additional charge. Tiny tots can have fun at Kid’s Club or Playground. 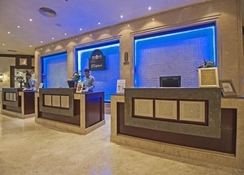 The hotel has facilities for darts, table tennis, volleyball, aerobics, game room and billiards (additional charge). The hotel’s on-site water sports centre offers diving and windsurfing. Guests can also shop at the shops on-site. There is lively evening entertainment and a nightclub too. Some facilities may incur a local charge. Everywhere was spotless, gardens immaculate, clean beach, great stay. Second visit, we will return. Booked a last minute holiday, just a cheapie, to get a bit of sunshine!! Fabulous food, great drinks beautiful hotel and setting. All staff were excellent. We sat on the beach one day and said that there was not a single thing that we could complain about, and we are fairly fussy! A real winner!